The mattress industry is changing at a rapid pace – there are now more mattress manufacturers on the market than ever before. If you’re someone who is in the market for a new mattress, there’s never been a better chance to get a great deal. Online mattress companies have made it their mission to provide their clients with the most affordable and practical mattresses possible. You won’t have to worry about spending thousands of dollars on a mattress you can’t afford. While many new companies have entered the industry, there are plenty of heavy-weights that still produce tons of mattresses for Americans. Serta is the largest mattress company in the United States – they have a reputation for being the original American mattress. While they don’t offer some of the same benefits as newer mattress makers, they have over 80 years of experience bringing comfort and support to people’s bedrooms. Serta make a ton of different mattresses, but in this article, we’re going to take a look at one of their most popular items – the Serta Premium Mattress in a Box. It also happens to be one of their most affordable mattresses. If you’re in the market for a new mattress, it’s important to do as much research as possible on what the mattress and manufacturer can offer you. If you’re thinking of purchasing a Serta Premium mattress, we highly recommend that you take in as much information from this review as possible. Should I Buy a Serta Mattress? You should never discount the way a mattress is produced – this is the best way to truly understand the product that you’re buying. If you’re someone who wants to do as much research as possible, understanding the materials and construction process should be the first step on your list. 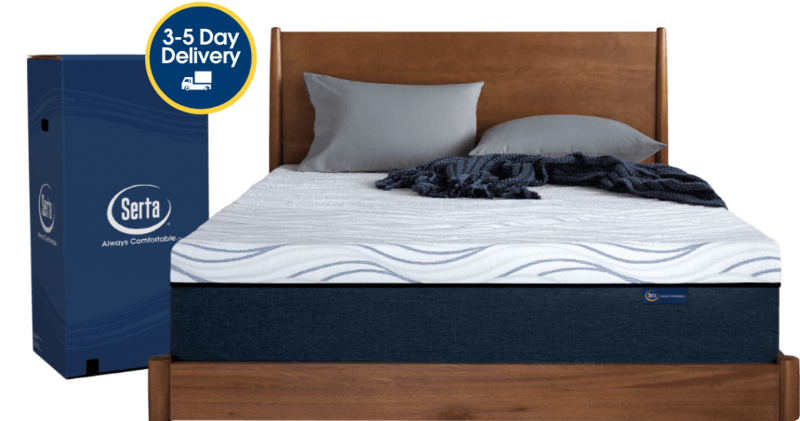 In this section of our article, we dive into the different components of the Serta Premium Mattress in a box – for the purpose of this review we’ll be looking at their 9” edition. Check it out below! The top layer of the mattress is comfort layer. If you’re looking to understand how a mattress will feel when you lie on it, this is the mattress layer that you need to understand. 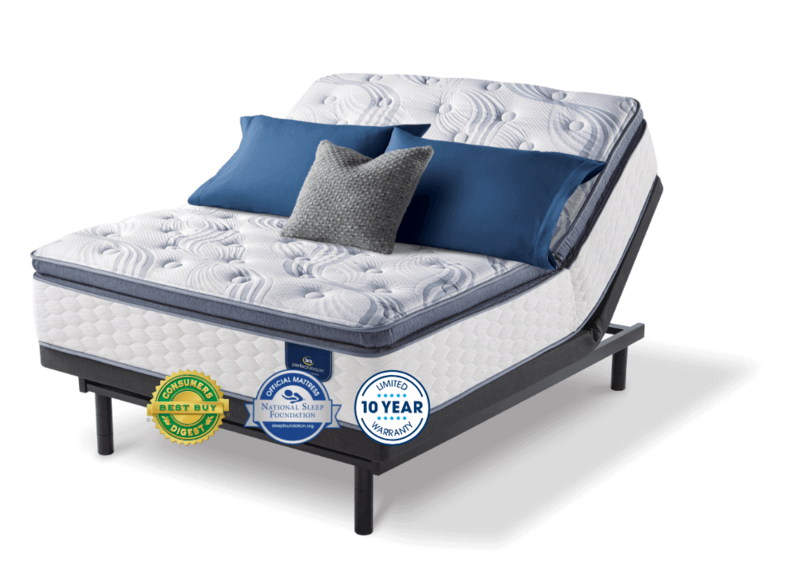 It’s made from a Serta Premium Gel Memory Foam – a proprietary memory foam that uses gel to increase softness and breathability. This is what allows you to feel as though you’re sleeping on cloud. This is the thickest component of the mattress. 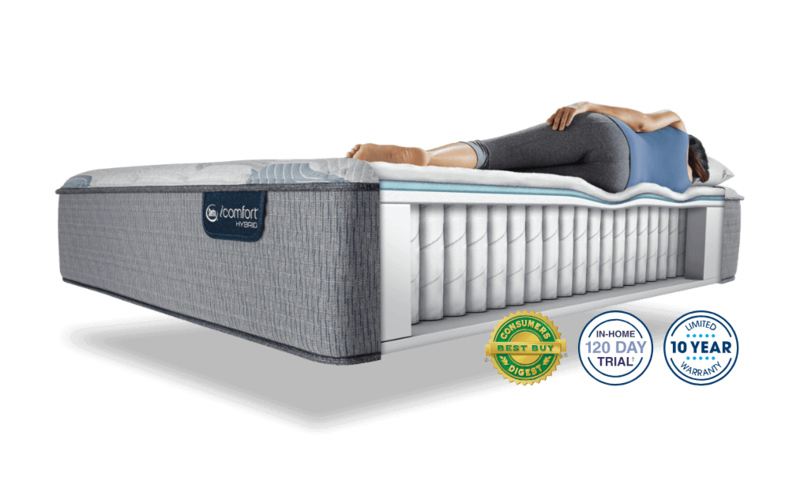 It’s made from a dense, Serta Gel Infused Support Foam – a product that is made exclusively by Serta. This foam provides support for the top layer of the mattress – it’s what gives the mattress the firmness it needs to keep you in place overnight. It’s just as important as the top layer! Not much information is provided about the Serta Premium Mattress in a Box cover – but what we do know is that it is very thing. This is a great attribute because it doesn’t interfere much with the mattress texture. In addition, it ensures that there isn’t too much heat retention while you sleep. Here is the most important part of the review. If you want to know how much you will enjoy sleeping on a mattress, the feel and support of the mattress is the most important component. As mentioned previously, the feel of the mattress is extremely comfortable. The top layer of gel-infused memory foam allows you to feel like you’re sleep on a cloud. You will feel like you are sinking into the mattress when you lie on it. It provides plenty of hug and contour around your body. In terms of firmness, the mattress is a bit above average. We rate it at around a 7.5/10 – meaning that it has slightly more support than the average mattress. If you’re someone who weighs a lot, you might need to find a bigger mattress as this one is quite thin for someone who weighs over 230 lbs. In terms of heat retention, memory foam tends to be a mattress type that retains too much heat. While this is the unfortunate truth, the Serta Premium Mattress in a Box is slightly better than your traditional memory foam mattress. The gel-infused layers offer more breathability for those who want to be certain they have a cooler sleeping experience. Still, you’ll find a coil system mattress does breathe a bit better than this! As the largest mattress brand in the country, Serta has undergone a lot of changes over the years. The company originally produced spring mattresses for their customers, but have had to change with the times. 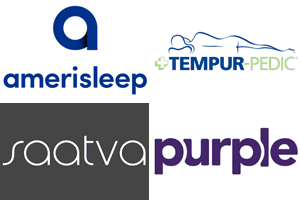 They now produce a wide variety of mattresses that include coil mattresses, hybrid mattress, foam mattresses, and more. There’s no doubt that they continue to change their offerings as the market progresses. You can find out more about their various mattress types on their website – keep an eye out for updates! If you haven’t been in the market for a new mattress for a while, you’ll be pleased to know that there are plenty of additional benefits that now come with your purchase. Mattress companies have had to step up their game to ensure they can compete with their customers. The amount of new entrants to the market also means that large companies have to compete with hundreds of new producers. This means that buyers can take advantage of a range of features if they know what they’re looking for. This is one of the most important components to have a look at. The warranty included with your mattress is vital in ensuring you’re able to reduce your risk as much as possible. If your mattress doesn’t have a warranty, you’ll have to spend hundreds or thousands of dollars in the future to replace it if something goes wrong. In addition, if a mattress company doesn’t offer a solid warranty, that means they don’t believe in their own product – the lack of a solid warranty is a clear indicator that manufacturer doesn’t trust their own goods. The warranty for Serta mattresses is 10-years – this means that you can have it replaced if there are any issues with the mattress in the next decade. This is in line with industry standards so it’s a solid warranty for people who want to ensure they’re properly protected. One of the best things about the mattress in a box from Serta is the fact that it comes with ‘Quick Shipping.’ This means you can expect to receive your mattress within 3-5 days of ordering it. If you’re looking to get a mattress in your home quickly, this is one of the best ways to do it if you’re looking to use an online retailer. In addition, this service is included in the cost of the mattress, so you won’t have to factor in expensive shipping costs to receive the mattress. Shipping a mattress can be expensive, so this is a solid benefit that should not be overlooked. Another awesome benefit of using Serta is the fact that their mattresses are present in a range of showrooms around the country. As the most popular mattress firm in the nation, you’re sure to find their mattresses in almost any city across the country. This means that you can go and try out their mattresses before you purchase them. In most cases, you can even purchase these mattresses in-store if you prefer to. With many modern mattress companies doing away with brick-and-mortar retail stores, this is a breath of fresh air to those who like to try products before they buy them. Serta also has a range of other products to choose from. Not only do they have one of the most extensive mattress offerings on the planet, they also make pillows and other sleeping accessories. If you want to purchase a different mattress than the one reviewed in this article, Serta has plenty of options for you to choose from. As the largest mattress brand in the nation, Serta knows it’s important to keep their customers happy. Many new mattress companies don’t have adequate customer service departments because they’re trying to cut down on costs. If you want to be able to get in touch with a customer care team when you have an issue with a product or order, Serta is one of the best options on the market. Most manufacturers have moved out of the United States in search of cheaper labor. This is often good for consumers because it means goods are much cheaper. But this also creates losses of jobs and other economic impacts we probably don’t notice. Serta uses USA-based manufacturing teams to produce all their mattresses. By purchasing a mattress from Serta, you’re also showing that you care about local jobs – it’s a win-win situation! The last benefit worth discussing is the fact that Serta is an award-winning brand. The company has been able to establish itself as one of the most reliable mattress companies in the country for a reason – they’re good at what they do. They received the award for best mattress in the country from Women’s Choice Awards from 2014-2018. This is a significant achievement and proves that you can rely on Serta to produce a high-quality mattress for you and your family. If you’re in the market for a cheap memory foam mattress that has the backing of a major mattress manufacturer, this Serta Mattress is one of the best options for you. Since it is made from the most popular mattress brand in the nation, you can rest assured that the company knows how to produce a solid product. It’s a bit on the thinner side, but this won’t be an issue if you’re of a normal weight – there is plenty of support in the mattress. On top of this, there are great benefits and features included in the cost of the mattress. You have a solid warranty and quick shipping included. They also have a great customer service team if you need any help. If you still think you’d prefer another mattress, we have everything you need on our website. There are tons of great mattress reviews that can help you make the right purchasing decision – check them out!